Editor of An Cosantoir Magazine with some ramblings and stories of mine – views are my own! Athy, Co Kildare, is a thriving market town located approximately 65km from the Red Cow/M50 junction and 22km from the Curragh Camp and is the place where the River Barrow and the Grand Canal meet. Athy became one the initial Anglo-Norman settlements after Richard de Clare (Strongbow) granted the area of Le Norrath to Robert FitzRichard in 1175, and other Anglo-Norman lords, including Robert St Michel, settled on the surrounding lands. At the beginning of the 13th century, the St Michel family built Woodstock Castle, and it was outside this castle that the first Anglo-Norman settlement developed. Subsequently burned and sacked a number of times, it is believed the town was walled as early as 1297; walls that were maintained until well into the 15th century. 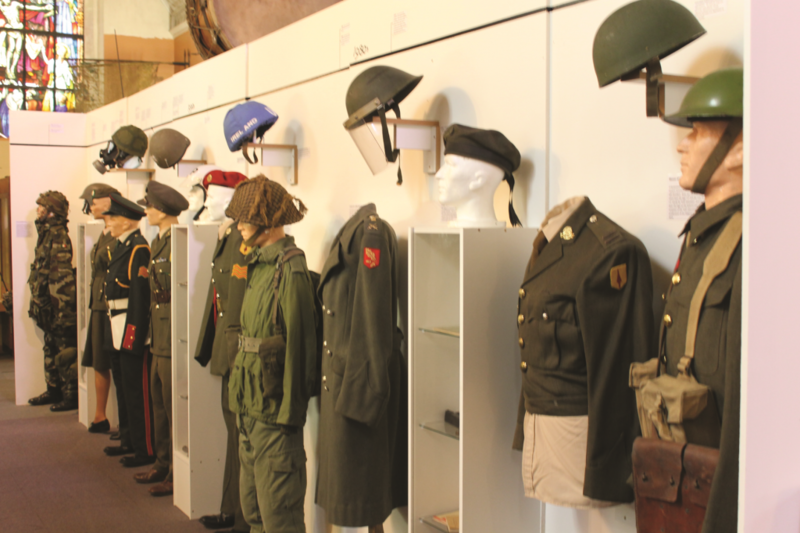 Athy Heritage Centre’s military history section. When I visited the Heritage Centre I met with local historian Clem Roche, who took me through the town’s military history, which predates the establishment of the Curragh. Clem has researched the exploits of Athy men through many wars and told me that they have been serving in the military since the 1730s. 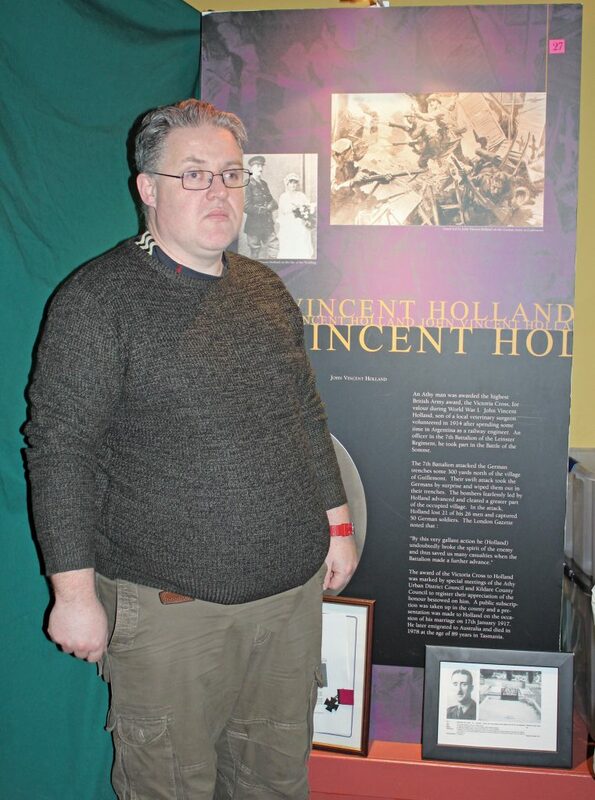 Local historian, Clem Roche, beside the John Vincent Holland VC display. The story that caught my attention was that of John Vincent Holland, born in Athy in 1889, who won a Victoria Cross (VC) in World War I. Holland attended Clongowes Wood College near Clane, Co Kildare, studying veterinary medicine for three years before leaving in 1909 for a more adventurous life in South America, where he tried his hand at ranching, railway engineering and hunting. 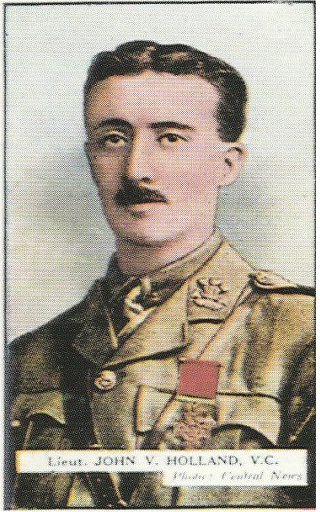 On the outbreak of the Great War, he returned to Ireland and was commissioned as a lieutenant into the Leinster Regiment. He was wounded at the second battle of Ypres in 1915 but recovered to take part in the Somme campaign of 1916, serving as a bombing officer with the 7th Battalion of the Leinsters. “most conspicuous bravery during a heavy engagement, when, not content with bombing hostile dug-outs within the objective, he fearlessly led his bombers through our own artillery barrage and cleared a great part of the village in front. He started out with twenty-six bombers and finished up with only five, after capturing some fifty prisoners. By this very gallant action he undoubtedly broke the spirit of the enemy, and thus saved us many casualties when the battalion made a further advance. He was far from well at the time, and later had to go to hospital”. Holland, clearly a modest man, attributed his award to “the fidelity and extraordinary gallantry” of the men he commanded. On his return home, he received a civic reception but did not remain in Ireland. He served for a time in the Indian Army, returning as a major during World War II. He finally settled in Australia, where he received a state funeral after he died in Hobart, Tasmania, on 27th February 1975. It was my interest in this VC winner that initially brought me to Athy to find out more about its military past. This led to my meeting with some of the veterans who had started St Michael’s ONE branch in the town, one of the newest branches in the veterans’ organisation. 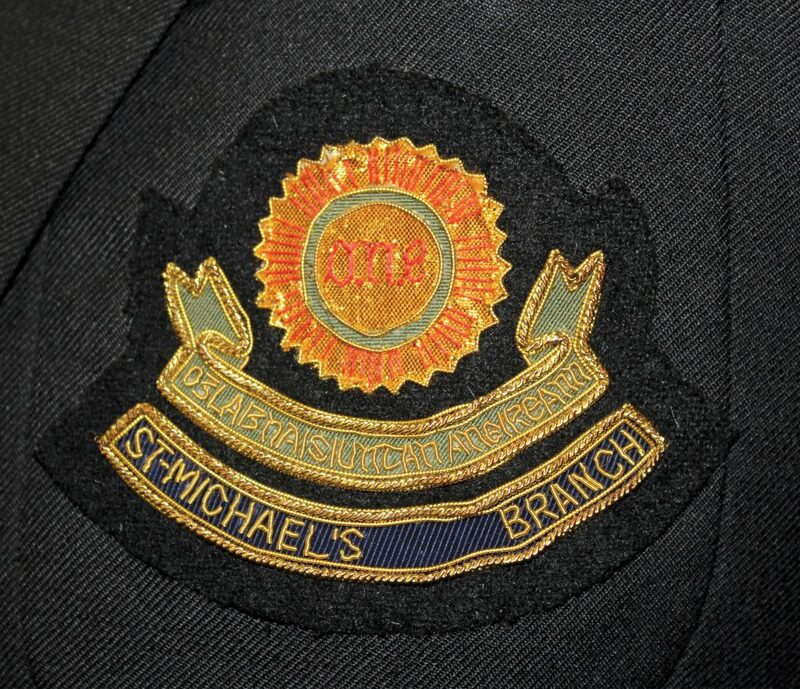 The branch, which was established nearly five years ago and has 12 full-time members and seven associates, takes its name from the parish of St Michael’s, which in turn takes its name from the St Michel family mentioned earlier. For the first four years, St Michael’s Branch held their monthly meetings in Dominican Hall and Methodist Hall on the Carlow Road before moving to Athy Community College (with many thanks to Principle Richard Daly) for the last year. I met with several members of the branch to get some background. Branch Chairman Kevin Carton, originally from Wicklow, spent his career with the Transport Corps in the Curragh. Branch Secretary John Roche, an Athy native who comes from a large military family, served with the Ordnance Corps, also in the Curragh. Other branch members at the meeting were Anthony Davis, formerly Medical Corps; Pat Roche (John’s brother and the father of Clem, the local historian who had been my guide in Heritage Centre) formerly Artillery Corps; John Lawlor, from Athy, formerly of the Engineer Corps; William Lawlor, who served in the Curragh and Dublin; Liam Foley, from Athy, who served in the Military College; and John Roche’s wife Kathleen and his other brother, Michael, who are associate members. At the start of our meeting, the branch members paid tribute to Raymond Clarke, one of their founding members, who sadly passed away three years ago. Raymond had served with An Slua Muir and Civil Defence. John recalls the meeting held in 2013 in Fingleton Auctioneers in the town to see if there was sufficient interest and ONE CEO Ollie O’Connor came along and spoke to those present. There was great interest and Kevin says: “Starting off it looked good with numbers.” Of course, though, starting off any venture like this provides many challenges and obstacles to overcome so it was by no means easy but all agree it was worth the effort. The branch has an excellent Facebook page that lets people know what they are about and to share photos of events/projects they are involved in. One of those projects, cleaning and renovating the grotto on the Monasterevin Road, has earned great acknowledgement for the branch. 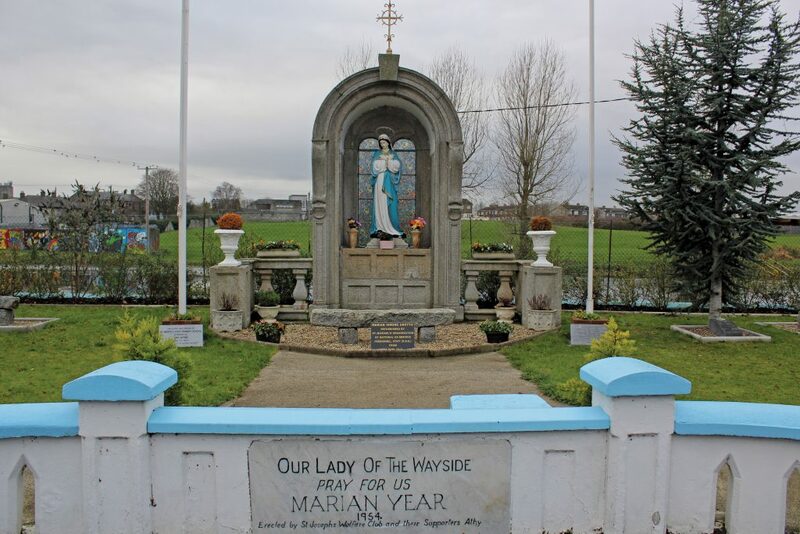 Due to the branch’s efforts the grotto, originally built in 1954 by the Lower St Joseph’s Residents’ Association, now includes a roll of honour for the 87 members of the Defence Forces who died on overseas service, and has won numerous awards, including the Athy Tidy Towns Award in 2016 and again in 2018, jointly with another location. Among the branch’s many activities last year, they took part in the town’s St Patrick’s Day parade and provided a guard of honour for the visit of the Rose of Tralee. The branch does a fair amount of annual fundraising, including holding a number of raffles, collecting for ONE’s Fuchsia Appeal and lotto draw. Their local charitable work includes donating large, framed pictures to St Michael’s Parish Church, and plaques in the old and new graveyards. As a result of all of the above, this young branch has already made an impact locally. John said the branch receives very positive feedback in the town for their charitable work. 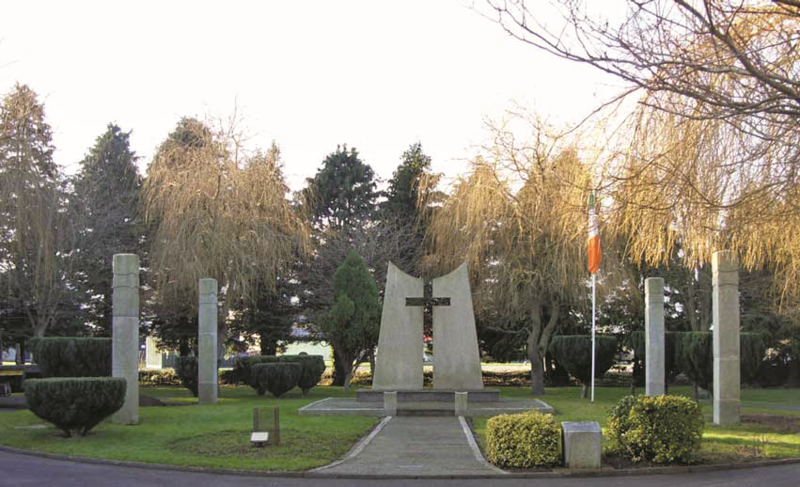 In recognition of its community spirit, St Michael’s Branch became the first ONE branch to get a civic reception when they were given one by Kildare County Council in March 2018, at which the branch gave a presentation on the Fuchsia Appeal to the councillors to make them aware of the plight of veterans. I was very impressed with the comradery within the branch and by the respect in which they are held locally. It was also good to meet the members in person after having come across them at many veterans’ events over the years. Read these stories and more in An Cosantóir (The Defender) The official magazine of the Irish Defence Forces – www.dfmagazine.ie. As previously published in An Cosantóir in March 2013 issue. 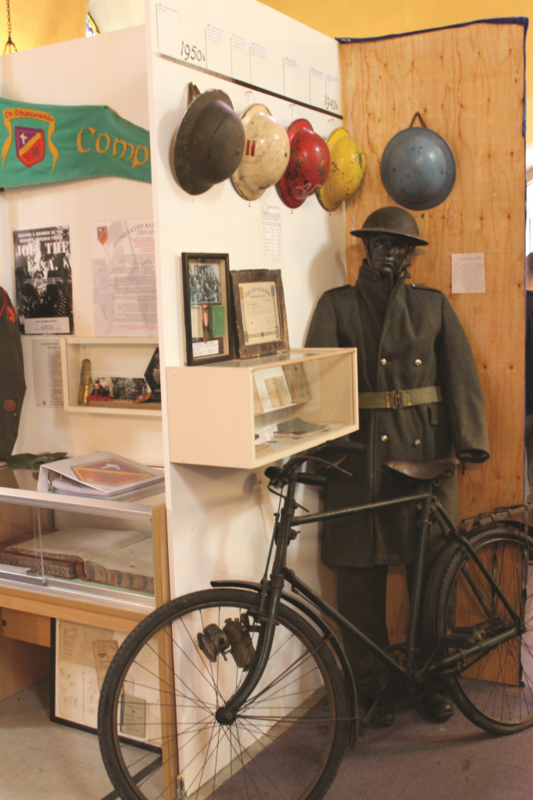 The Carlow Military Museum punches well above its weight and its story is as interesting as the stories of the 7,500 items it currently holds. 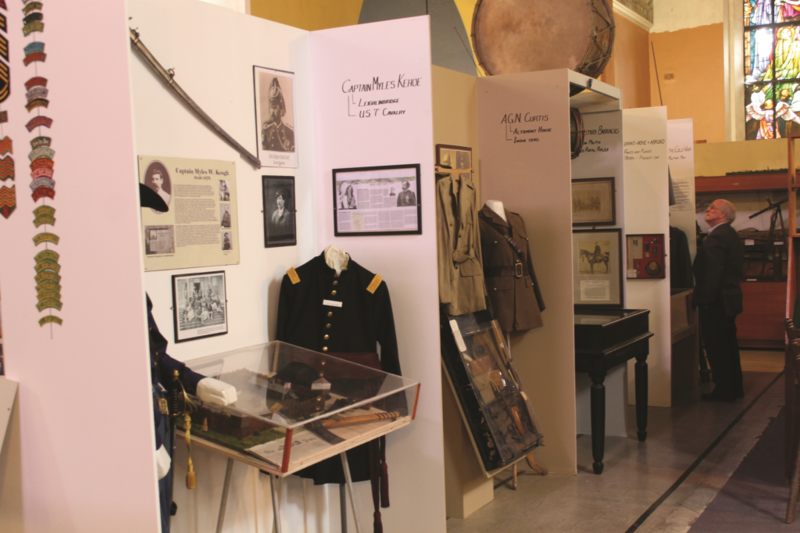 The museum began life in 1995 as a memorial to Chief Warrant Officer Donal Cunningham, a Carlow native who served with 10 Inf Bn before moving to America, who, after several tours abroad as a helicopter pilot, was killed in a training accident in Cyprus. To remember Donal, some of his former comrades in the Reserve put together a collection of his kit in their drill shed. As word grew, donations came in and it became apparent that a larger building was needed. After a long search, the group was allocated St Dympna’s Church, in Carlow Hospital grounds, by the Health Board. The church is ideal for the museum as it is an historic building in its own right: the stained glass window over the altar, worth over €1.2 million, has proven to be an attraction all of its own. The move to the church in 2001 was only the beginning of many years work and dedication on behalf of the volunteers. 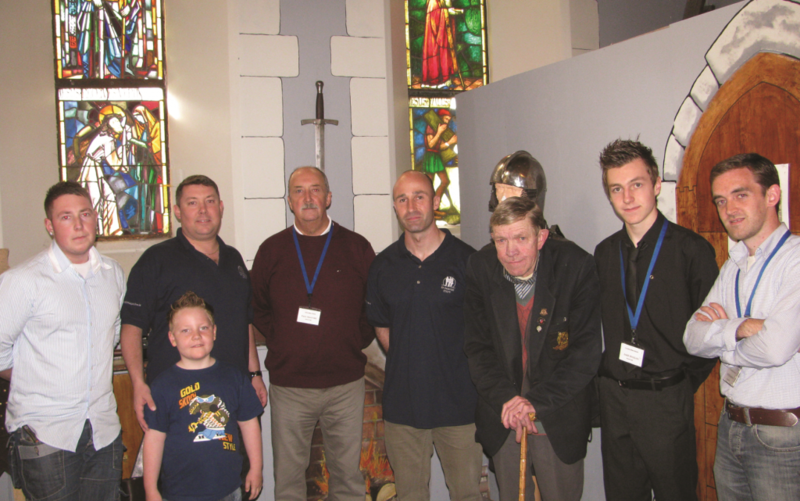 Today the military museum covers all aspects of Carlow’s warrior history, from medieval times to the 21st century. Most displays are interactive. For example, the medieval exhibits give a real sense of the weight of chain mail armour and weapons, and an appreciation of the time it took to get suited up for battle. There’s also a small area on the 1798 rebellion with a restored ‘Brown Bess’ musket holding centre stage. 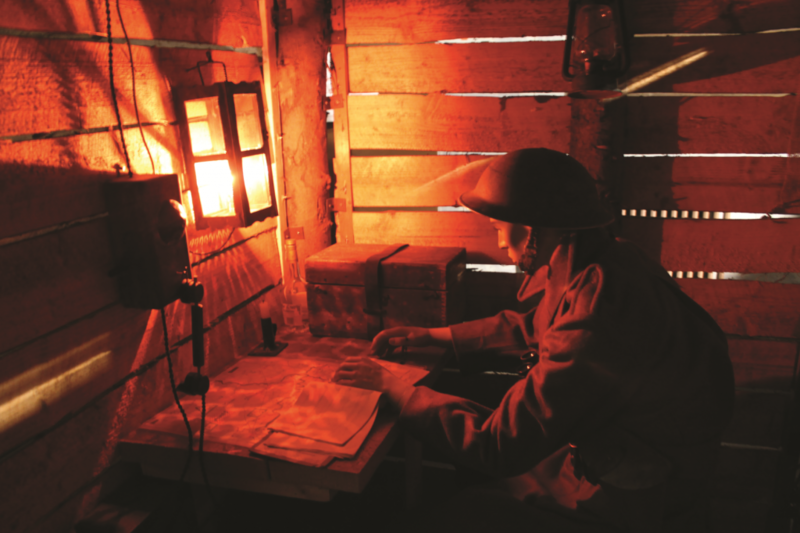 The most extensive exhibits in the museum cover the period from 1900 to 1950, with a selection of uniforms, ordnance, bayonets, kit, and an atmospheric reconstruction of a three-man observation trench overlooking no-man’s land in Ypres. 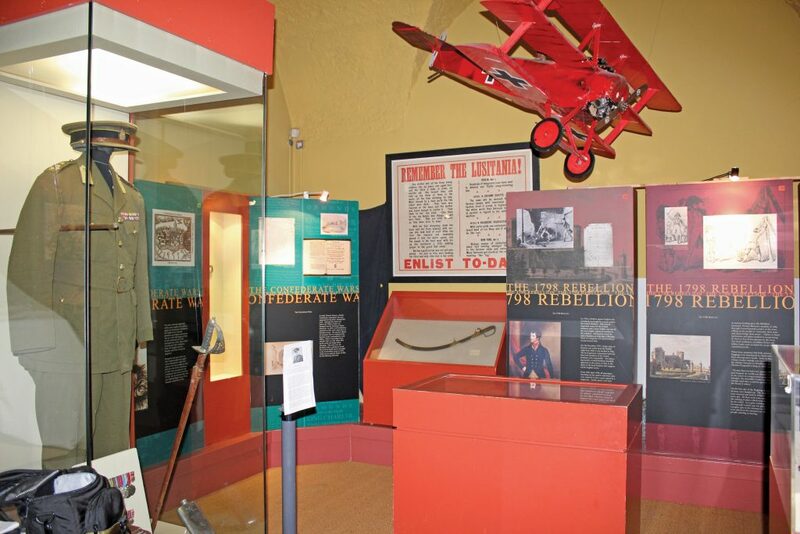 All the exhibits have a Carlow connection and were donated by people who served in various armies, or by family members. 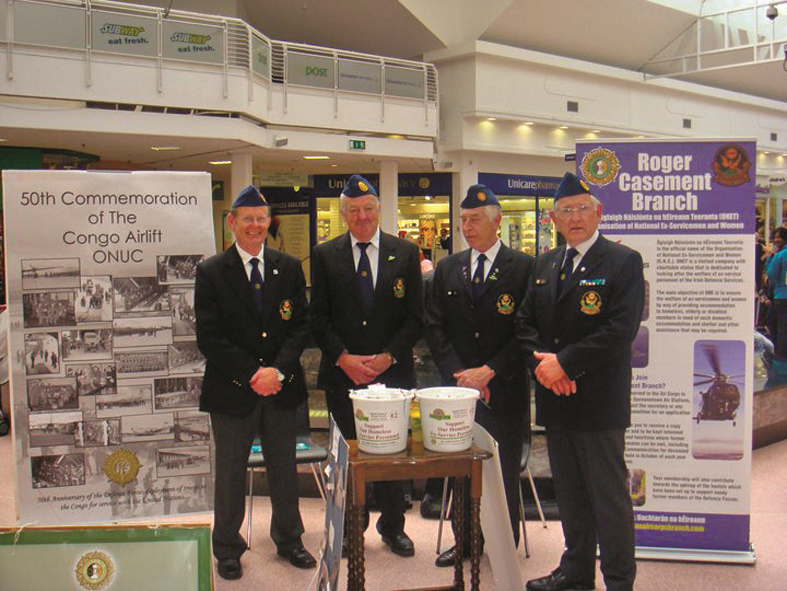 All donations are cared for by a dedicated team of volunteers and together they highlight the personal sacrifices made by the people and families of Carlow during various wars. The museum has just received a donation of Black-and-Tan medals and even during our visit donations of various medals were made. Taking main stage in the medal collection is the Military Star awarded to Lt Kevin Gleeson, who lost his life in the Niemba Ambush, a significant event in Defence Forces’ history. All services are represented, with an Air Corps presentation and a display for PO TJ Doyle, who died in service with LÉ Róisín. Members of 10 Inf Bn were key in advertising and collecting for the museum and the unit is now honoured with an area that celebrates its life and times. Many older serving or retired members of the DF would remember the various uniforms, kit, bicycles and comms equipment on display. A lot of the ordnance and kit was sourced with the help of Comdt Gerry Shinnors (Retd) and is reason enough for a visit. There’s even a collection of DF pottery complete with chamber pot! As previously published in An Cosantóir in July/August 2013 issue. 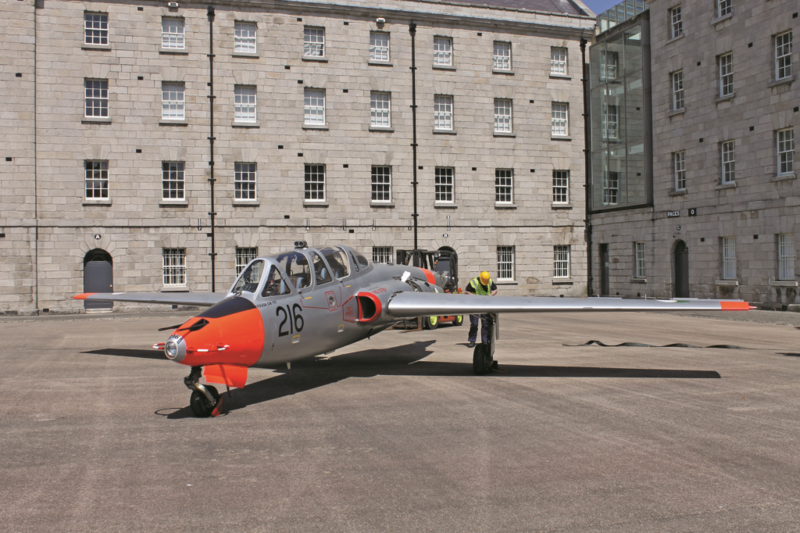 In the early hours of Monday the 5th June members of the Air Corps transported a Fouga Magister aeroplane (216) from Casement Aerodrome, Baldonnel to Clarke Square, in Collins Bks. 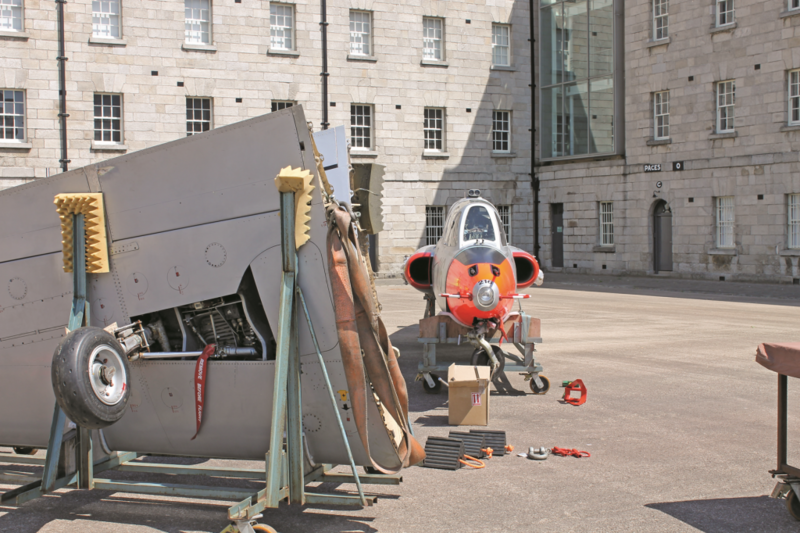 The plane was then reassembled and will be on display in the National Museum of Ireland: Decorative Arts & History and is on load for the summer months from the Air Corps Museum & Heritage Project. “It’s a great privilege to be displaying a Fouga Magister aircraft, we are very grateful to the Air Corps” said a member of the museum staff. With its distinctive ‘butterfly’ tail, the iconic French built Fouga CM 170 Magister was a 1950s two-seat jet and was Fouga’s greatest success with nearly 1,000 constructed. It had a top speed of: 715km/h, a wingspan of: 12m and a length of: 10m. 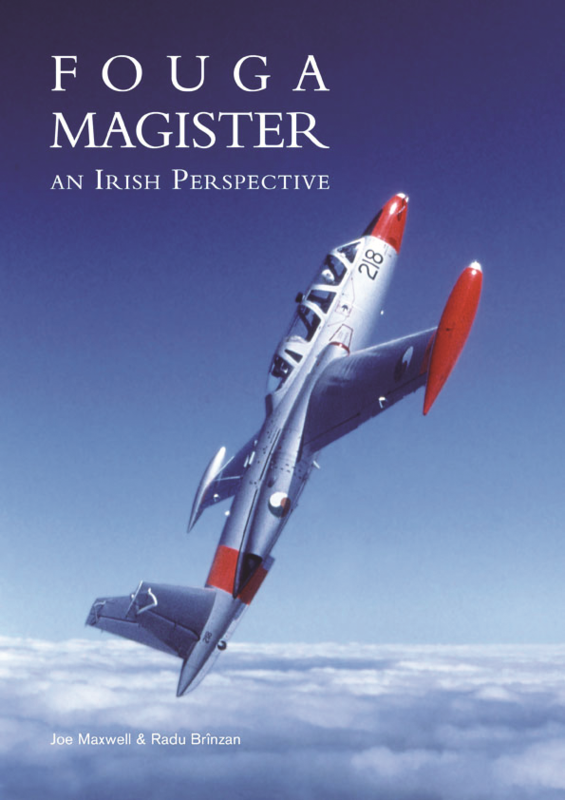 The Fouga Magister has a unique place in Irish military history: one was used to attack Irish troops serving as UN peacekeepers in the Congo in 1961. 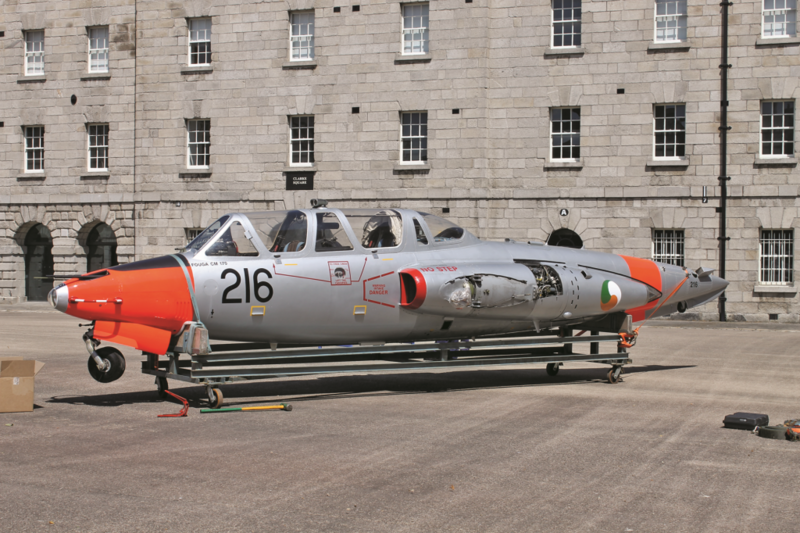 This lone Fouga was flown by a Belgian mercenary in the Katangan Air Force who carried out the bombings and machine gun attacks on Irish troops. 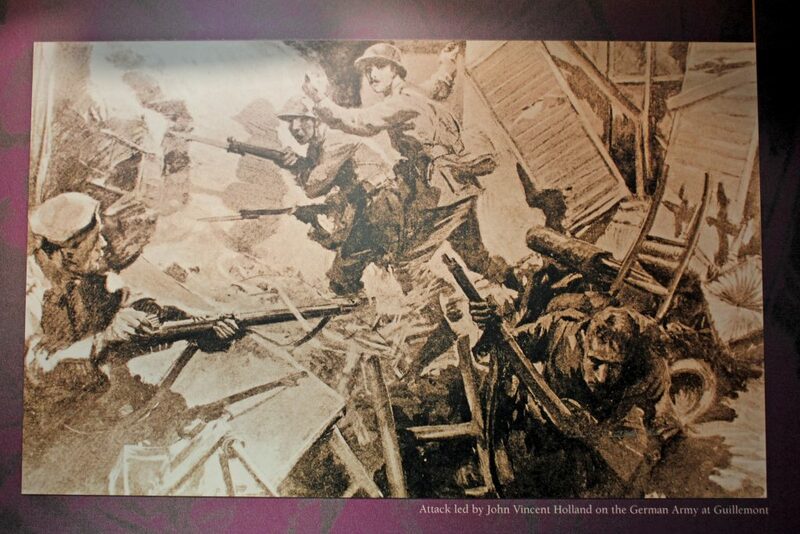 This was the first occasion on which Irish troops would experience an air attack. The Air Corps operated six Fouga Magisters (CM170-2) from 1975 to 1999, four of which equipped the Silver Swallows Aerobatic display team. The Silver Swallows were famous internationally for winning the Lockheed Martin Cannestra trophy for ‘best display by an overseas team’ at the Royal International Air Tattoo at Fairford in 1997. This plane is one of those used by the Silver Swallows. As previously published in An Cosantóir in May 2012 issue. 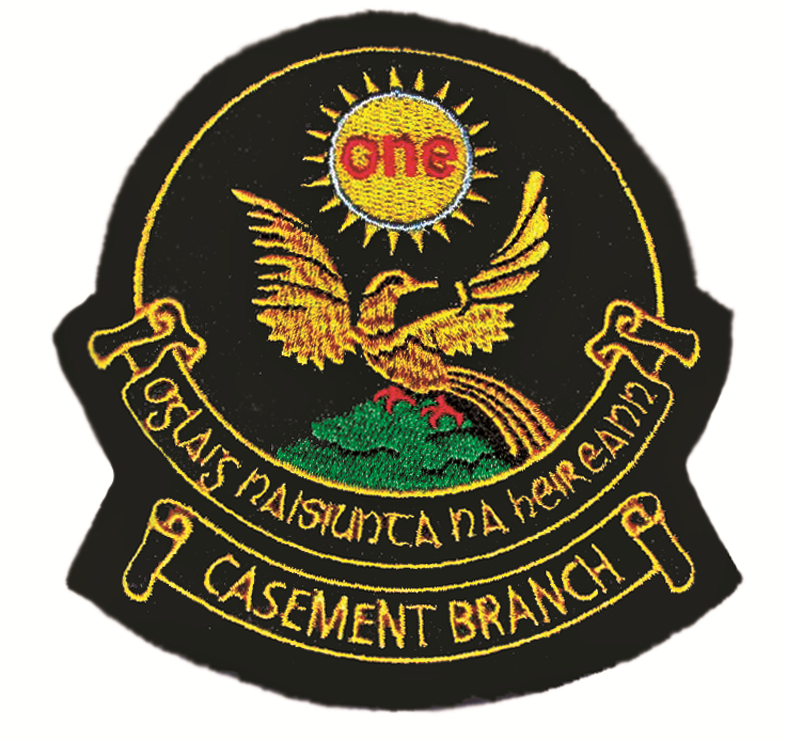 The Sir Roger Casement Branch of ONE (Organisation of National Ex-Servicemen and Women) was established in Casement Aerodrome, Baldonnel, in late 1979. 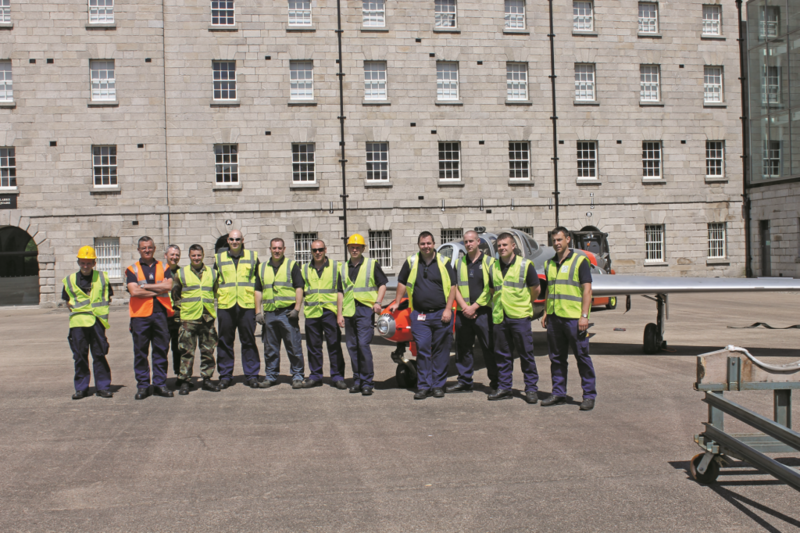 The branch has grown from strength to strength over the years mainly due to the efforts of its members and the great relationship it has had since its foundation with successive GOCs and serving Air Corps personnel. 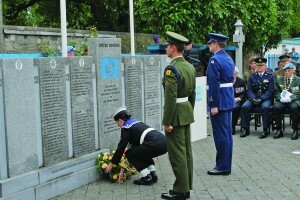 Significant events undertaken by the branch include: establishing the ONE Memorial Garden in Baldonnel with a monument to the memory of deceased former Air Corps personnel who have served within the Air Corps; holding an annual Mass of Commemoration in the Garrison Church; the presentation of a unit flag designed by a member of the branch to the Apprentice Training School; and a presentation to GOC Air Corps of a book of copies of the letters of Roger Casement. In addition, every year the branch organises a number of trips to places of historical interest as well as organising events that provide an opportunity for former colleagues to meet and renew old acquaintances. An example of the latter is the annual Christmas lunch for retired Air Corps personnel. This very popular event has become a favourite reunion for former colleagues. Paddy O’Meara, who stood down as branch chairman in January 2012, joined the Air Corps as a boy apprentice in 1956 and served for 12 years, mostly as an instructor in the Air Corps Apprentice School, retiring as a flight sergeant in 1969. After leaving he joined AnCo the industrial training authority that had been recently set up to promote industrial training throughout the country. Paddy has been an active chairman since his election in January 2007. During his tenure he oversaw the updating of the magazine-style version of The Link newsletter, which is circulated to all members on a quarterly basis and is greatly appreciated particularly by overseas members. An extensive website was created that provides full details of the branch’s history, committee, and details of upcoming events. Copies of The Link are also archived on the site. The website has been the key in generating contacts from many former Air Corps members who are scattered around the world and who wish to maintain contacts with their old comrades. A new Facebook page and email address were also created for the benefit of all members. In addition, Paddy successfully negotiated with the board of ONEt and the Dept of Defence, with the kind support of the GOC Air Corps, for approval for the members of the branch to wear Air Corps-style forage caps as part of their ONE uniform. This headgear has been very popular with the members. It further identifies the branch and its members with the Air Corps family and branch membership has increased as a result. A programme of collection days was set up in selected shopping centres to generate support for ONEt’s national Fuchsia campaign. These collections were professionally arranged with the use of advertising posters, backdrops and videos. In addition to the funds generated, the PR spin off for the branch was invaluable, particularly with the communities in the Baldonnel, Clondalkin and Dublin Airport catchment areas. Paddy will continue to serve as a committee member, with special responsibility for maintaining the communications systems, and he wishes the incoming chairman every success in the position. The new chairman, Finnbar Lyons, enlisted in 1953 as a direct-entry aircraft mechanic and served with No 1 Fighter Squadron (Gormanstown) until he left in 1961 to work for Aer Lingus as an aircraft technician. Finnbar says his main focus as chairman will be to continue Paddy’s great work through the communications media, events and outings, and to increase membership, which currently stands at 150+. As previously published in An Cosantóir in December 2013/January 2014 issue. On 8th November 1960, the biggest loss of life of Irish soldiers in any single incident overseas happened in the Belgian Congo. 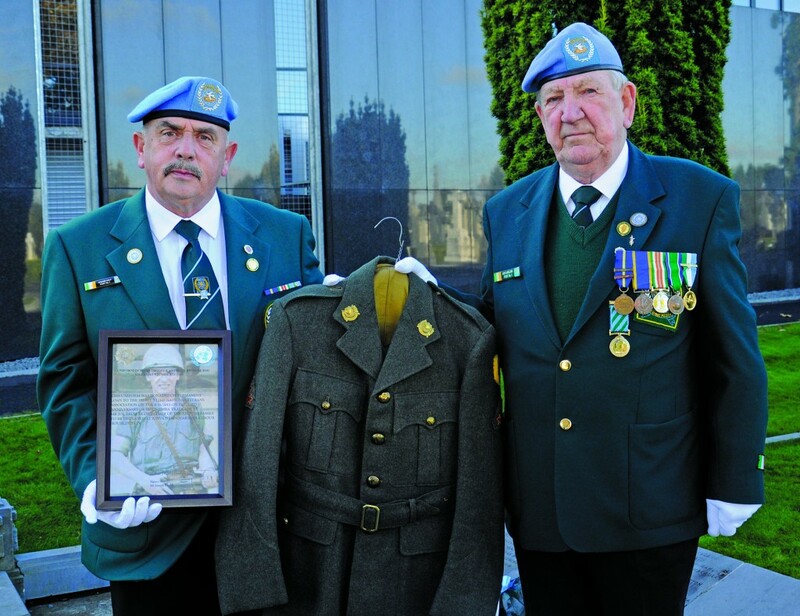 This heartbreaking and significant moment in the history of the Defence Forces took place while these troops were serving as UN peacekeepers with 33 Inf Bn as part of the Organisation des Nations Unies au Congo (ONUC). 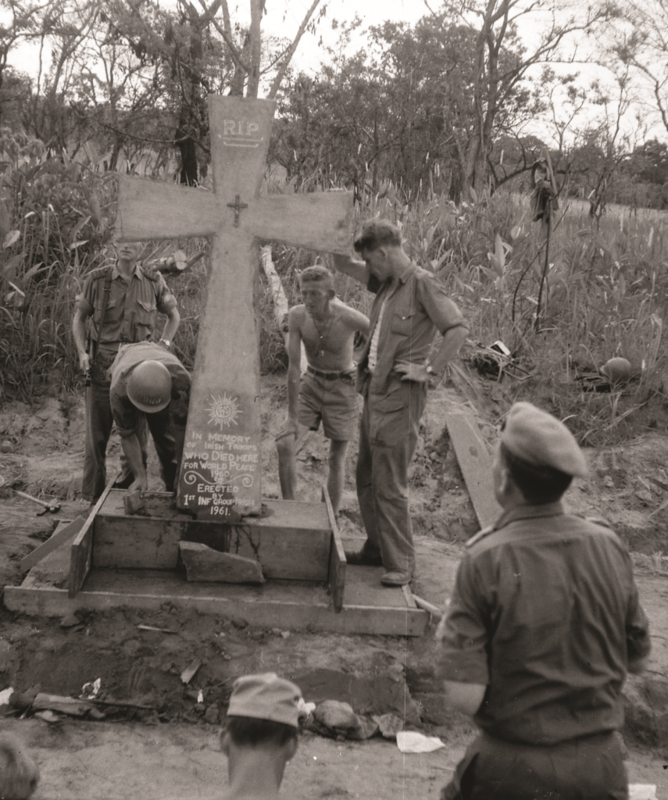 Erecting the Niemba memorial in the Congo, 1961. On that fateful day Lt Kevin Gleeson took his 11-man patrol over a bridge on the Luweyeye River near the town of Niemba where Baluba tribesmen ambushed them. After a courageous fight against overwhelming numbers, nine of the patrol were killed. One member of the patrol, 20-year-old Tpr Anthony Browne from Rialto, Dublin, survived the initial attack but was subsequently killed. His body was not found until November 1962. 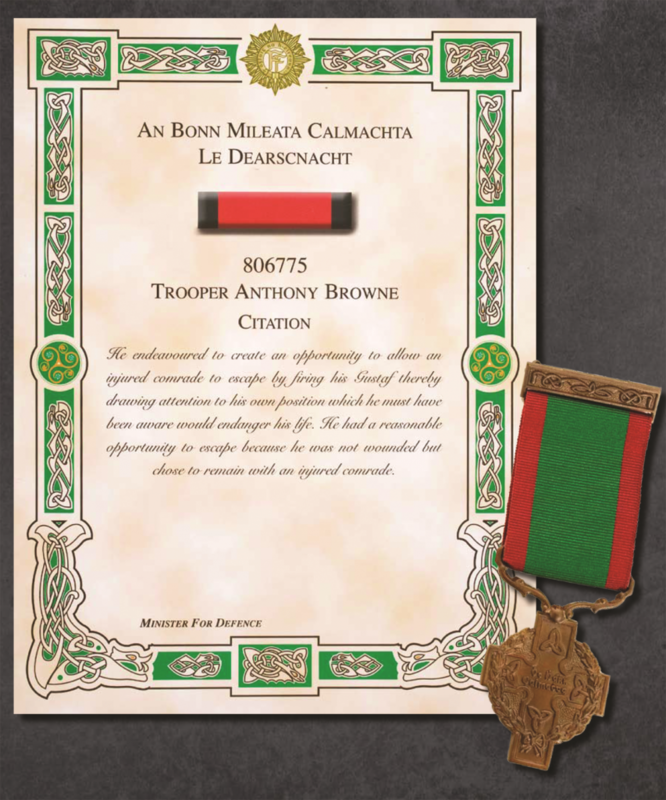 Tpr Browne was also posthumously awarded the first ever An Bonn Míleata Calmachta (Military Medal for Gallantry), the Defence Forces highest military honour, for his conduct during the ambush. Those that lost their lives were: Lt Kevin Gleeson (30), Sgt Hugh Gaynor (29), Cpl Peter Kelly (25), Cpl Liam Dougan (34), Pte Matthew Farrell (22), Tpr Thomas Fennell (18), Tpr Anthony Browne MMG (20), Pte Michael McGuinn (21) and Pte Gerard Killeen (27). Two members of the patrol survived, Pte Joseph Fitzpatrick (then 21) and Pte Thomas Kenny (then 24). On 10th November 1960, in a follow-up operation to recover remains, Pte Patrick Davis died after he was shot accidentally. He was laid to rest with his colleagues from the ambush. From 1960 to 1964, 12 Defence Forces units with almost 6,200 troops, served with ONUC. 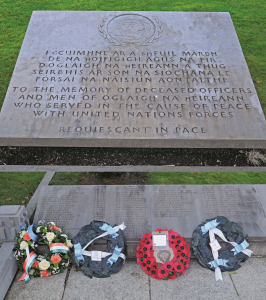 In those four years 26 Irish troops paid the ultimate sacrifice in the name of peace. 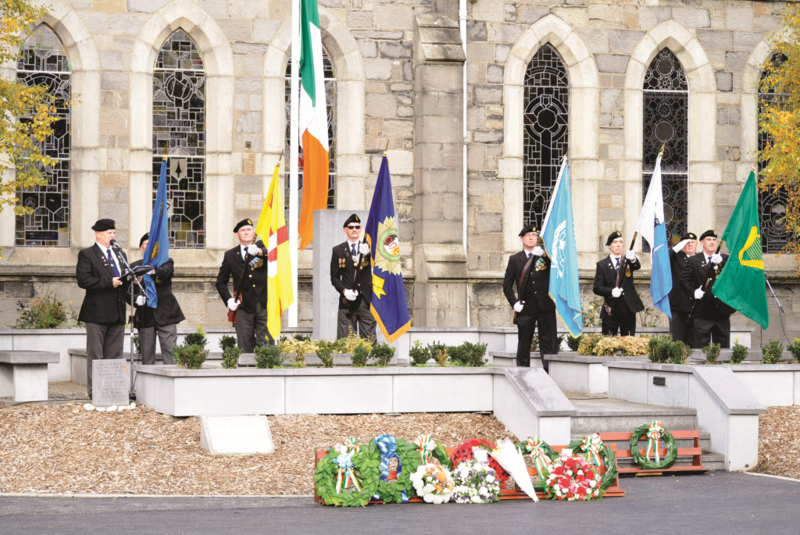 On Saturday 9th November 2013, the 53rd Niemba Commemoration took place in the Garrison Church, Cathal Brugha Bks, with a Mass at 1200 hrs followed by a wreath-laying ceremony at the Memorial Garden outside the church. The annual ceremony is organised by the Organisation of National Ex-Servicemen and Women (ONEt) on the first Saturday in November. The veterans of ONEt and IUNVA provided a guard of honour and the ‘Last Post’ was played by members of the Army No 1 Band. This was followed by a minute’s silence, ‘Reveille’ and then the national anthem as the national flag was raised to full mast. Wreaths were laid by Deputy Lord Mayor of Dublin, Councillor Pat McCartan; Chief of Staff Lt Gen Conor O’Boyle; Secretary General of the DoD Maurice Quinn; ONEt President John Hennessey; the UK Ambassador HE Dominick Chillcot; US Defence Attaché Lt Col Sean Cosden; Dan Garland of IUNVA; Lt Col Joe Aherne (retd) of ARCO; Brig Gen Jerry Enright (retd) of 33 Inf Bn; Comdt Earnan O’Naughton of RACO; Mark Scally of PDFORRA; Comdt Eugene Gargan of RDFRA; Declan Pendred of the Irish Naval Association; Noel Cullen of the Royal British Legion; and Martin Coyne ONEt (on behalf of the American Legion in Ireland). Also present was former Swedish army officer Stig von Bayer who served in the Congo at the time of the ambush. 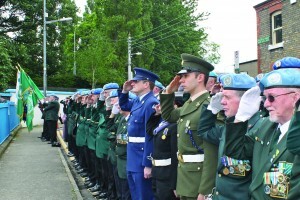 Even though most of these trailblazing peacekeepers have now retired, their memories of the Congo and places such as Elizabethville, Jadotville and Niemba are still very strong within the Defence Forces as we continue to remember and honour them. 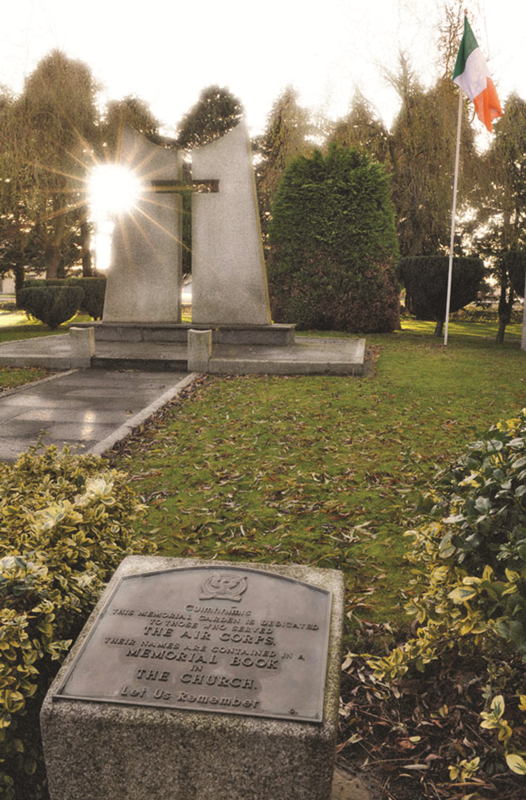 On the previous day, Friday 8th November, members of the IUNVA, with families and friends of troops of 33 Inf Bn, held a ceremony and reception in Glasnevin Cemetery and Museum at the monument and plot for Irish soldiers who died while on service with the UN and for members of Óglaigh na hÉireann, which is where the state funeral for those who died in the Niemba Ambush took place. After the ceremony the family of Tpr Anthony Browne (MMG) presented his old bull’s-wool uniform to IUNVA for a loan. It will be put on display in IUNVA’s HQ at Arbour Hill. 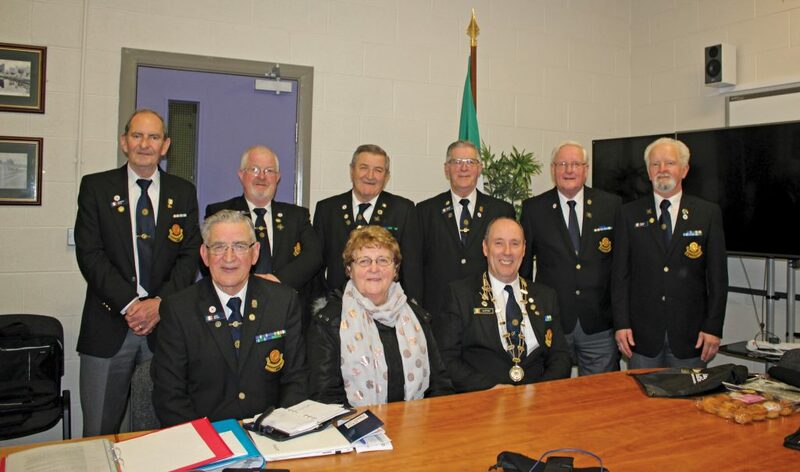 On Tuesday April 1st, An Cosantóir met with one of the newest branches of the Organisation of National Ex-Servicemen and Women (ONE), the Royal Meath, situated in the north Leinster area. 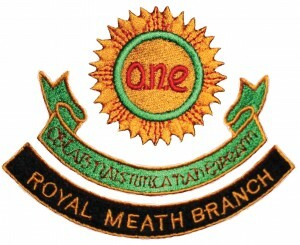 The Royal Meath branch was set up just over a year ago (January 2013) so that ONE members from the area wouldn’t have to travel to Dublin or Drogheda/Slane for ONE meetings and events. 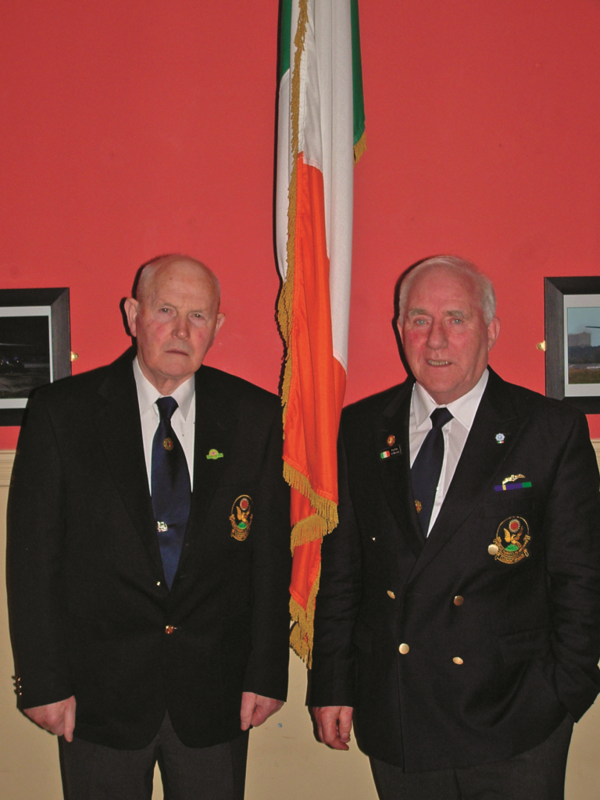 The branch chairman, Conor Swords, who has served with ONE for 25-years, told us that he and other members of the Fr James Gilmore Branch (Artane) established the new branch and formed a committee. They canvassed the areas of Kells, Navan, Trim, Oldcastle and Virginia looking for new members, and now have 34 active members in the branch. Members of the new branch have sponsored three flags (national, UN and branch) as well as the chairman’s chain of office. 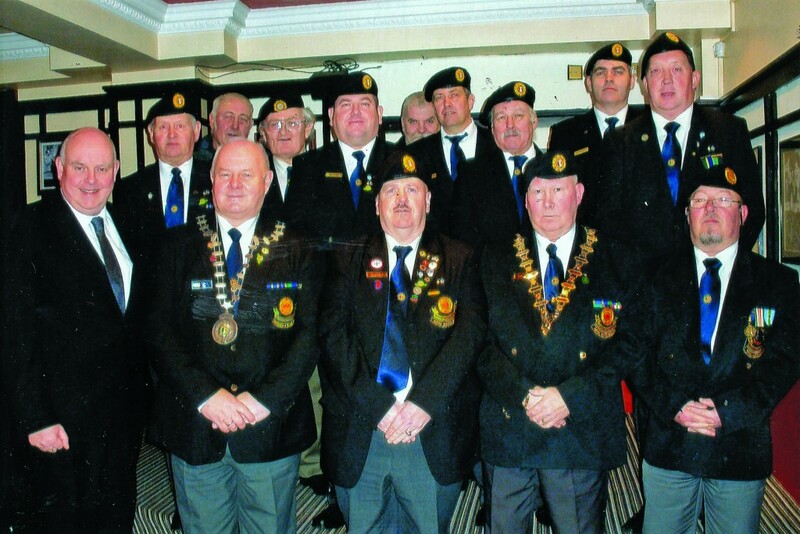 Despite being in existence for just over a year, the Royal Meath Branch has taken part in many events, and not just ONE events; others have included the French Foreign Legion Day, Anzac Day, and the Royal British Legion. 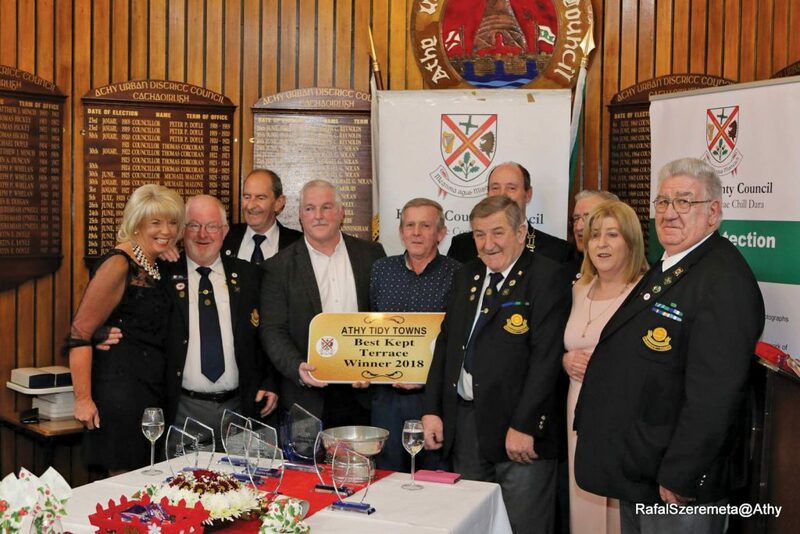 The Branch has also built up a great relationship with the Thurles Memorial Trust, with Royal Meath members being made honorary members of the Trust. The Branch has planned a church collection on August 3rd and they hope to hold their first annual Mass and Lá na bhFiann (Soldier’s Day) in September. Branch PRO, Bridget Quinn, who is possibly the first female PRO in ONE, told us that branch members have a long history of travelling on the International Military Pilgrimage to Lourdes, with Bridget completing 14 trips and Conor with in excess of 20. Always on the lookout for new members, the Branch meets on the first Tuesday of every month in the Martry Restaurant (formerly the Silver Tankard), Kells Road (R417), Navan, Co Meath. Prospective members can also contact Peter Rogers, the branch secretary, on 086-4040049 or Bridget Quinn on 087-8332762. 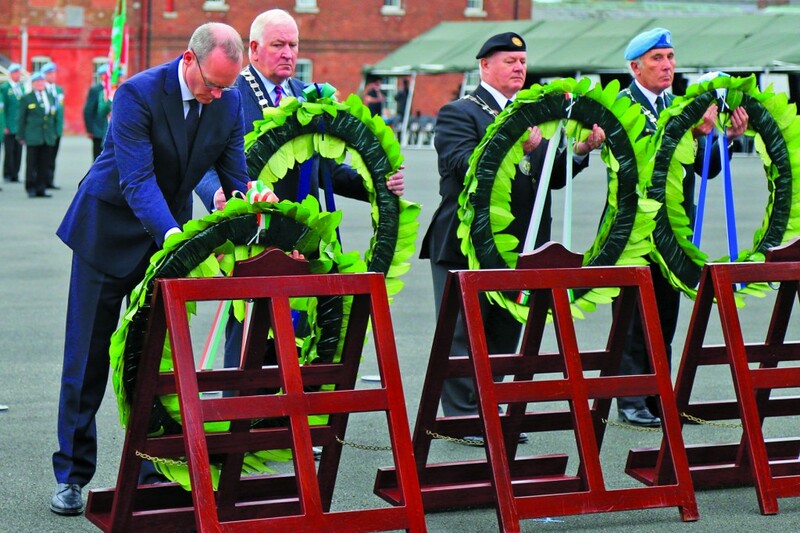 On May 25th 2014, the Irish United Nations Veterans Association (IUNVA) held their 16th annual wreath-laying ceremony in remembrance of all Defence Forces personnel, members of An Garda Síochána and civilian personnel who died on UN peacekeeping missions throughout the world. 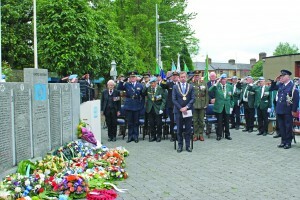 The ceremony was held at the memorial garden in IUNVA’s HQ on Mount Temple Road, behind Arbour Hill Church and Cemetery, where a memorial stone is inscribed with the names of those who sacrificed everything in the cause of world peace. The garden was opened by President Mary McAleese on November 8th 1998. What makes this year special is that it is the 25th anniversary of the formation of IUNVA. It also marks the 50th anniversary of the formation of UNFICYP in April 1964, when 606 members of 40 Inf Bn arrived in Cyprus, and the 50th anniversary of the ending of Irish involvement in the Congo when 2 Inf Gp left ONUC in June of the same year. The ceremony started at 12am with the parade commander, Sgt Major John Egan (retd), marching the UN veterans into position. Then the MC, Comdt George Kerwin (retd), introduced the IUNVA chairman, Michael Butler, to address all those present. DCOS Sp, Rear-Admiral Mark Mellett DSM, addressed the parade, thanking IUNVA for making sure the memories and names of all those that made the ultimate sacrifice for world peace are remembered. Fr Pat Mernagh CF and the Very Rev John Marsden, Dean of Kildare, led those present in prayers and then Airman Michael Whelan read out his poem ‘Fallen Friends’. The roll of honour was then read out by members of IUNVA posts from around the country. 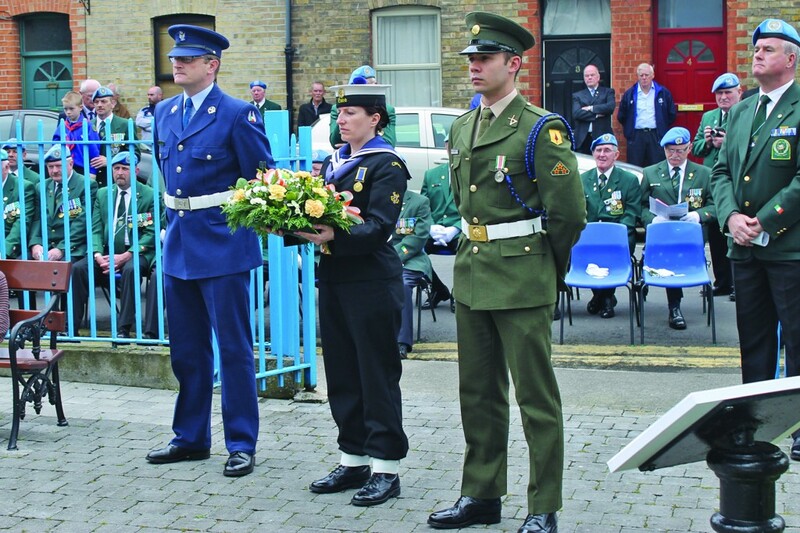 Wreaths were then laid on behalf of the Defence Forces by Airman Michael Whelan (Air Corps), Pte Tadgh Luby (7 Inf Bn) and A/Sea Michelle Thompson (Dublin Unit, NSR). 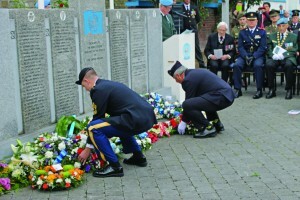 A wreath was also laid by representatives of other armed forces. After representatives and families laid their own wreaths a minute’s silence was observed by all before a piper’s lament was played followed by ‘The Last Post’. The National Flag was then raised and the bagpipers were joined by two members of the Army Band in playing the National Anthem. The day went very well and although it was such a solemn occasion it was very uplifting with everyone enjoying the parade and the opportunity to remember lost loved ones in good company. 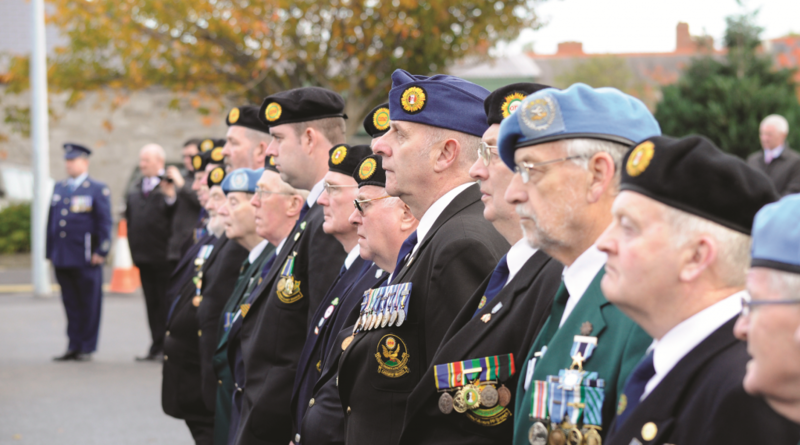 On 2nd September 2014 the first Defence Forces Veterans’ Day Parade was held on McDermott Square, DFTC, Curragh Camp. Many veterans from around the country joined under their respective flags. 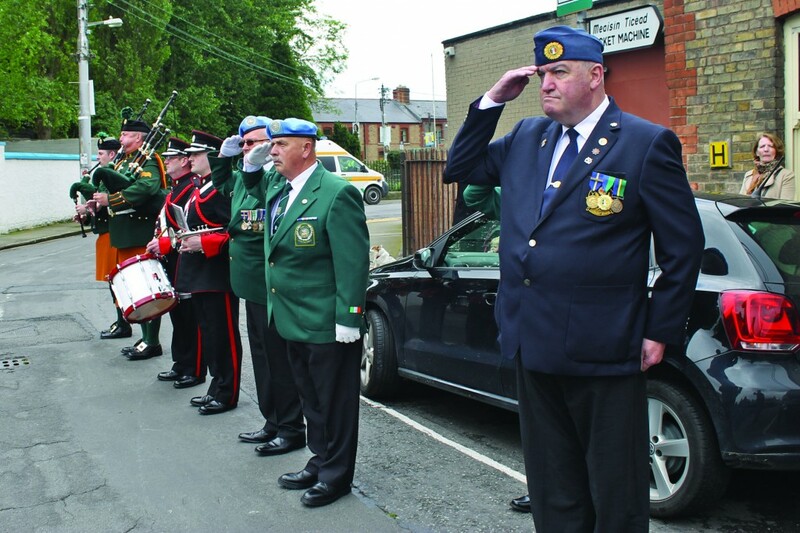 In attendance were the Irish United Nations Veterans Association (IUNVA), the Organisation of Ex-Servicemen and Women (ONE), along with the Association of Retired Commissioned Officers (ARCO). The Minister for Defence, Mr Simon Coveney TD, officially attended and was accompanied by the Chief of Staff, Lt Gen Conor O’Boyle and Brig Gen Seamus Ó’Giolláin, GOC DFTC. 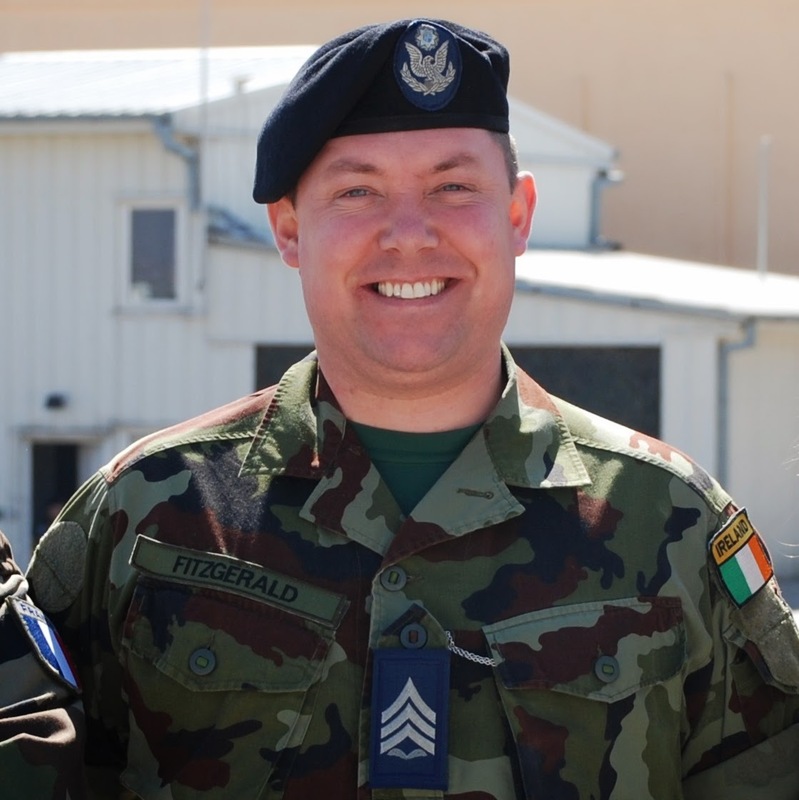 “There are many honours and responsibilities associated with service in the Defence Forces. Today I am happy to acknowledge the important service that former servicemen and women have contributed to Irish society in domestic operations and in hostile regions around the world. Today we are recognising the service of all former members of the Defence Forces across all three services, the Army, the Naval Service and the Air Corps, at home and abroad”. 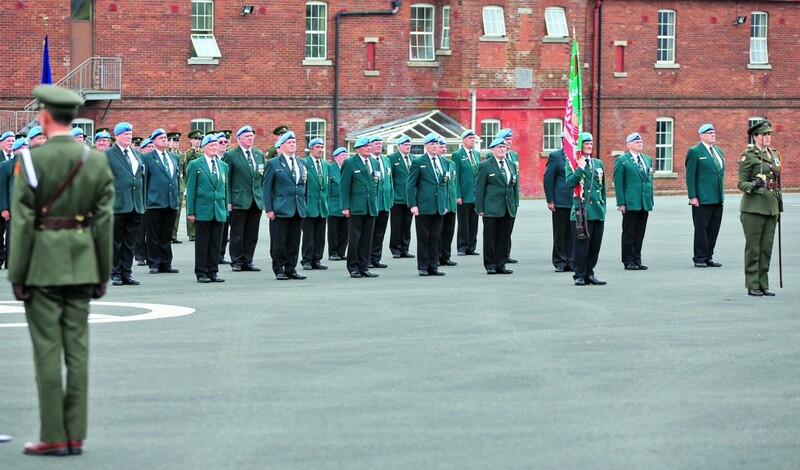 “The 27th July 1960 was a watershed moment when Ireland sent its first peacekeepers with the 32nd Inf Bn to the Congo, the first complete Irish unit sent overseas as part of a UN mandate. For a further fifty four years the Irish Defence Forces contributed to the cause of peace in places like Lebanon, Chad, Liberia, East Timor and Syria (to name but a few) and continue to do so today”. The Minister reviewed a parade of the representative associations, and also serving members from the Army, Naval Service and the Air Corps. Following a short multi denominational religious service by Rev Fr John Marsden and Rev Fr PJ Somers CF, and a lament was played by piper CQMS David Usher (Ord Sch), and then the Minister laid a wreath along with the three representative associations to honour our deceased servicemen and women. The Minister finished by paying tribute to the 86 members of the Defence Forces who died on operations at home and abroad in the service of their country, “They paid the ultimate price in the cause of peace”. The day was finished off with light refreshments and displays of current weapons and vehicles and also a display of historical vehicles and weapons brought in by the Irish Military Vehicle Group (IMVG). 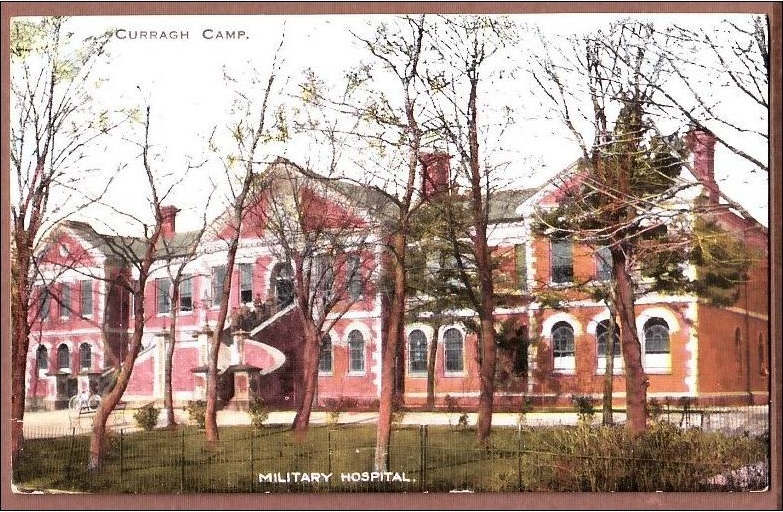 The Curragh Military Hospital has a long and varied history. Over many years its staff has treated British troops, World War Two internees, and IRA prisoners, as well as countless numbers of our own troops and their families since the Irish Free State Army took over the hospital from the withdrawing British Army in early September 1922. 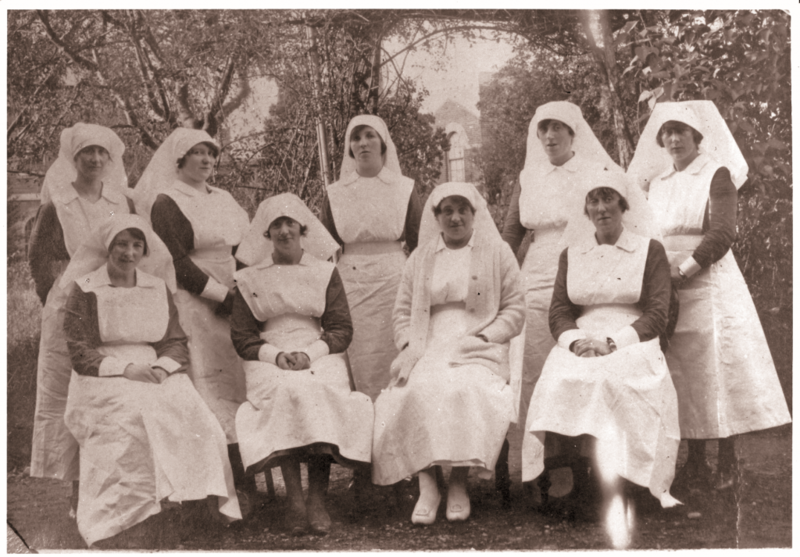 Members of the newly formed Army Nursing Service outside the Curragh Hospital in 1922, the only person identified is Sister Mary Ward (back row centre) from Kilfenora, Co. Clare, who was Lt Col CJ Browne’s great-aunt. One of its busiest periods was during the 1970s when many prominent Republican prisoners were treated there, including a number who had gone on hunger strike in Portlaoise Prison. 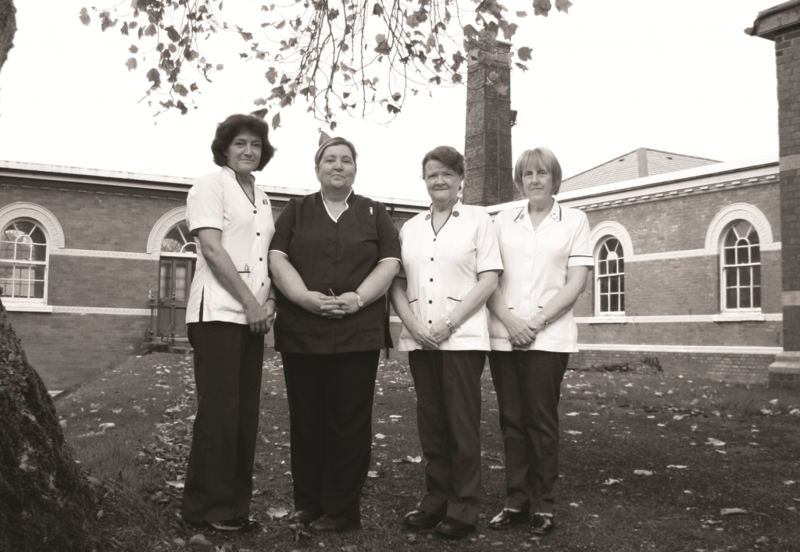 Many of the current sisters of the Army Nursing Service (ANS) came to the hospital during the ‘70s, and they speak very admirably of this period in the hospital’s history. Staff Sister Miriam Hyland told us that when she came in 1976 there were 34 sisters in the hospital providing full-time care 24/7, 365 days a year for soldiers, and from 1983/4 to their families as well. 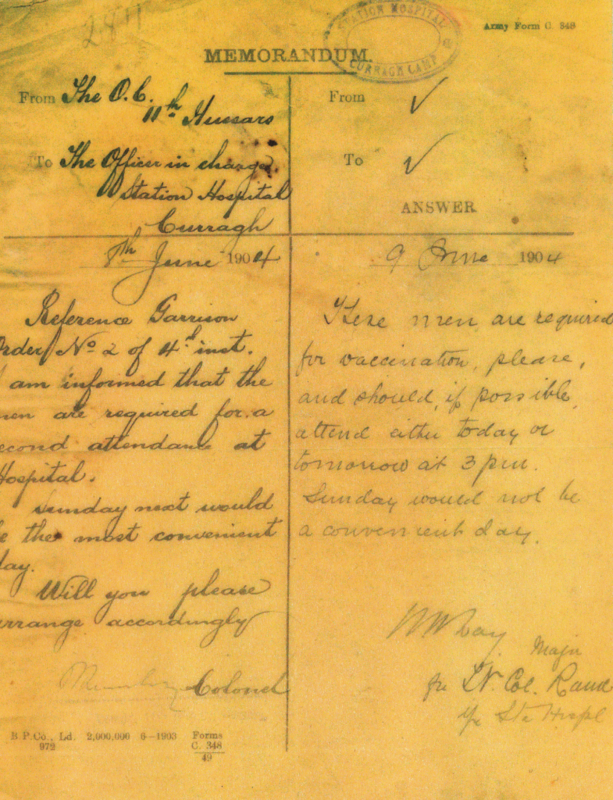 This document is an Army Form C. 348, dated 6th June 1904, from OC 11th Hussars asking for his men to be inoculated on a Sunday, and the hospital’s OC replying that Sunday was not convenient. The Curragh hospital was the first to be licensed to inoculate against yellow fever within the Defence Forces and over the last five decades the majority of our troops who have travelled overseas on UN peace-keeping missions have received their inoculations there. In the current era, the hospital’s main function is in the area of occupational healthcare, with the sisters specialising in vaccinations and operating the family clinic (the only one in service in the DF) and is centred on primary care. With only five sisters remaining the hospital provides out-patient and specialist clinics to soldiers, and GP care to their families. With the reduction in staff, the hospital now provides only a 9-5 military medical facility and the family clinic. With an average service of 32 years and a combined service of 158 years, the remaining sisters have some great memories, and also some tragic ones, from over the years. An interesting little fact we came across was a door on the now decommissioned chapel, which carried a sign saying ‘The blessed sacrament is not revered here’ and yet it still houses statues made by a Benedictine monk in the 1970s. Whatever the future holds for the hospital, we hope the long-standing ghost story of the army nurse in her grey uniform and red cape doing her rounds in Ward 7 in the middle of the night doesn’t put off any prospective tenant. Sister Deasy cares for a young family member Aaron Fitzgerald. We would like to thank Lt Col C Browne (Rtd), Lt Col M Murphy (OC CMH) and the sisters for kindly speaking to us and allowing us to visit. 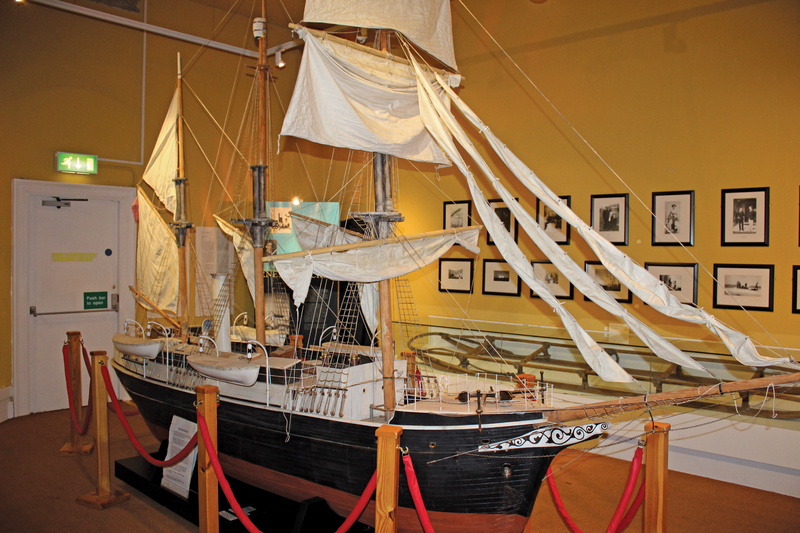 The Naval Association (INA) was established in 1962 and termed An Cumann Chabhlaigh. The Naval Association and its constitution was approved in May 1977 by the then Minister of Defence, Mr Oliver J. Flanagan, T.D. 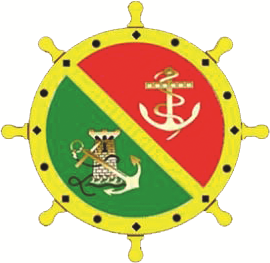 Membership of the Association is restricted to serving and retired Officers, NCOs and Ratings of the Naval Service, the Naval Service Reserve (formally An Slua Muirí) and the Marine Service (1939-1946) and the Maritime Inscription (1939-1947). At a meeting held at the Stella Maris Seafarers Club, Dublin on 24th March 1992, an Executive Council was elected and the first branch of the association was formed and subsequently called the Leading Seaman Michael Quinn Branch after L/S Quinn DSM who in 1990 gave his young life (27) in an attempt to rescue 16 stranded Spanish Sailors from their stricken trawler Nuestra Senora de Gardtoza, (Our Lady of Gardtoza) on rocks off Bantry Bay. Irish Naval Association General Secretary Declan Pendred parades INA Colours. The aims of the Association are: To promote Social, Cultural, Educative and Sporting Activities; To establish a comprehensive listing of all ex members of the different sections of the Naval Services since 1939; To render Aid and Assistance, when necessary; To promote and further interests in matters appertaining to the sea; To maintain the sea faring traditions of the Irish Nation. Irish Naval Association President Gerry Kennedy, laying a wreath at the Cenotaph memorial. 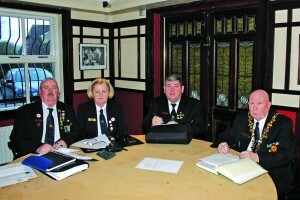 Active Branches of The Naval Association have been established in Dublin, Waterford and Limerick. 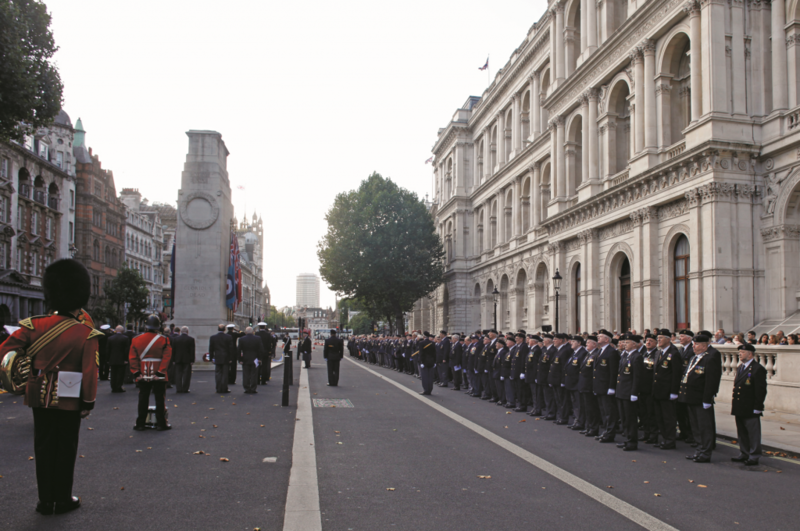 On Sept 11th 2011, The Irish Naval Association was invited to participate with the RNA at their Bi-Annual commemoration ceremony to the Cenotaph in London. 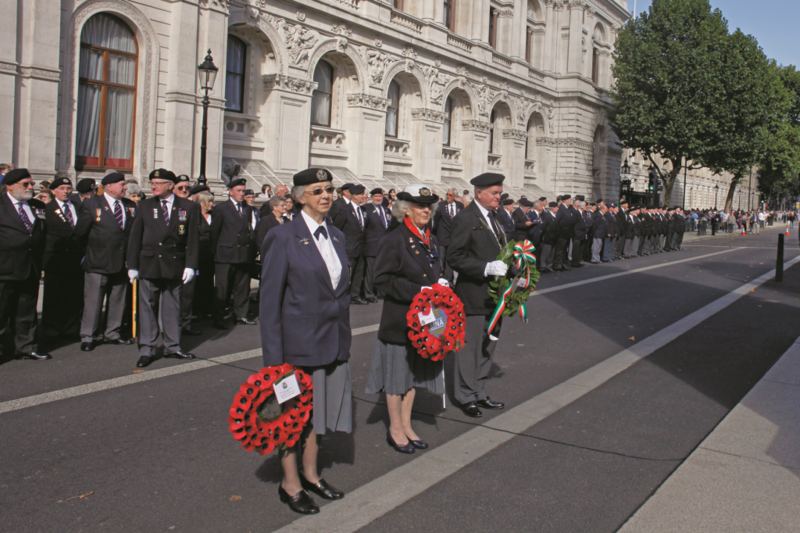 With over 360 Shipmates parading in Whitehall London with 62 Area and Branch standards and the National Standards of the Royal Naval Association (RNA), The Royal Marines Association (RMA), The Association of Wrens (WRNS) and the Irish Naval Association (INA). 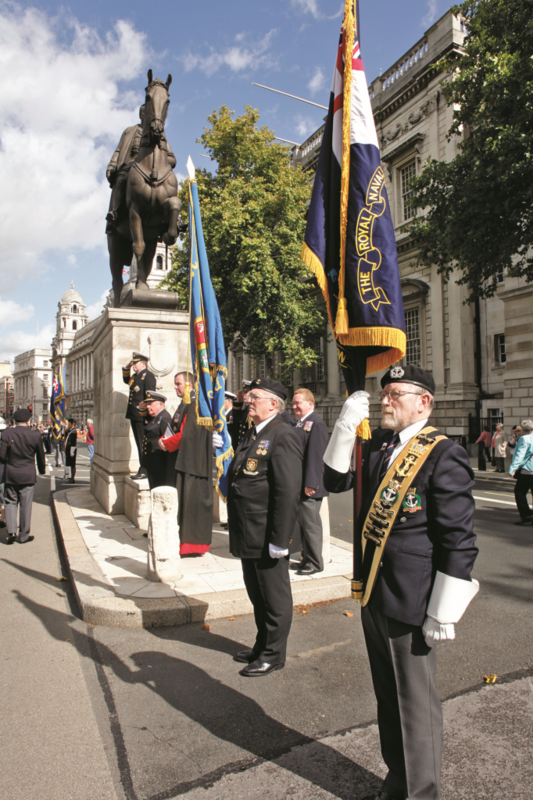 Note the privileged position given to the association at the Cenotaph. 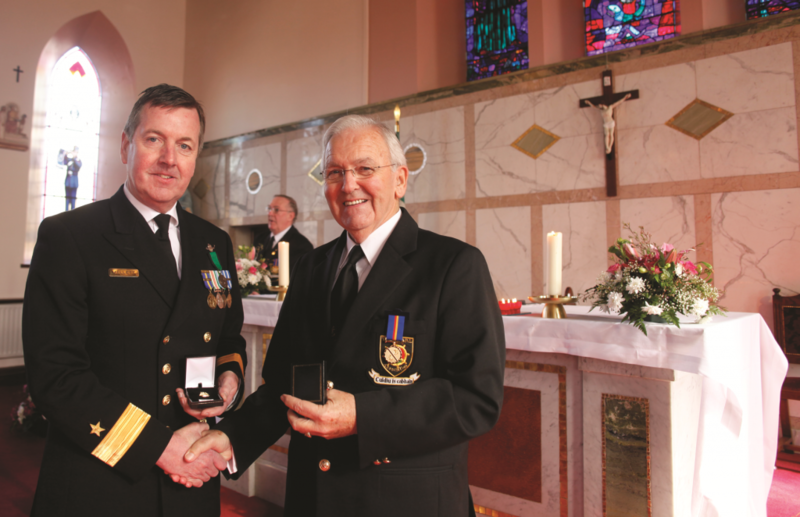 Commodore Mark Mellett DSM (FOCNS) and Lt Malachi O’Gallagher (Retd.) INA after receiving the Christy King Asgard Award at the presentation of the NA Service Medal awarded by National President Gerry Kennedy Naval Association.